Apple cider vinegar (ACV) is a natural bacteria killer,and effective in treating bacterial infections in the body. It's other proven health benefits include digestion aid, weight loss, and heart health. While I know it is good for me, I do not like the taste of apple cider vinegar. That is why I am so thankful when to have found such a recipe to get the antioxidants of unfiltered organic ACV in my system without the yuckiness of swallowing straight vinegar. If you follow this recipe, you does not taste the vinegar, it tastes much more like a slightly spiced warm honey drink. Pour cold ACV and honey into bottom of mug. Pour boiling water over cold ACV and honey and stir. 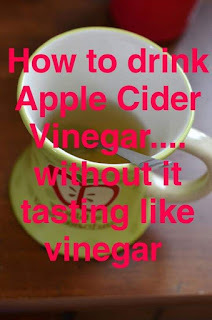 The order is important, it will not taste the same if you put water in first or try to boil the ACV. Drink slowly and repeat two to three times a day. Variations for flu: You may add drop of lemon essential oil or half a lemon, and cinnamon stick to enhance flavor. I learned the hard way that with strep throat, the lemon and cinnamon can irritate your throat if it's too raw. If you want a even more very effective use of Apple cider Vinegar for Sore Throat, then use the gargle mix recipe below. My friend told me about this and it really did lessen the pain in my throat very quickly. This is very effective, but also very very potent vinegar taste. If you buy the ACV with the mother in it (I recommend Bragg's ACV), it has less of a vinegar taste, and more kin to apple cider. Do not drink ACV straight, the acidity could harm your tooth enamel or lining of your esophagus. Mix together and gargle, the swallow. Repeat every hour or two for a few days or as needed. Great remedy and great website! We understand that in today’s busy schedule we often start depending on unhealthy choices, which is reflected in our health, skin, and hair. That is why we have brought to you 100% natural and organic apple cider vinegar.